Disclaimer: The advice provided in the Financially Fit series is general advice only. It has been prepared without taking into account your objectives, financial situation or needs. There are many reasons why you might want to look into investing opportunities instead of just piling money into a savings or checking account. To help understand a few of those reasons, I talked with Colleen Nolan, a CPA and financial advisor in the LND Group at Robert W. Baird & Co. Your greatest advantage right now is time. Check out this graph provided by the LND Group and Baird. The amount invested is the same – $5,000 for 10 years ($50,000 total) over different age periods. 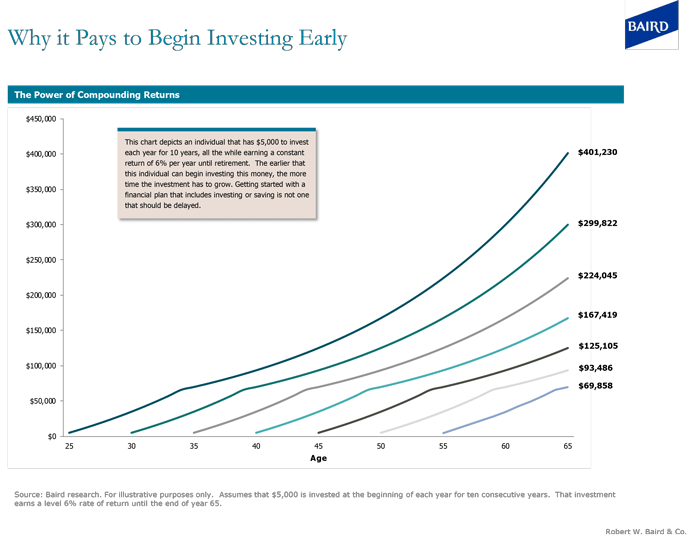 If you invested that $50,000 from 25-35, it can turn into $400,000+ by the time you are 65. However, if you wait 5 years and start at 30, you will only get around $300,000 – that’s a $100,000 difference – crazy, right? Image provided by the LND Group of Robert W. Baird & Co.
You give yourself a chance for a higher return potential. Investments have higher risk. But higher risk often means higher reward. “Most people have heard of the concept, “no risk, no reward”. While this may be true, and there are certainly risks when it comes to investing, risk in itself can be managed through careful investment planning and diversification. If you invested all of your money into one stock or company, you would be in a very risky position. If the company failed and the stock price fell to zero, you would lose everything you had. 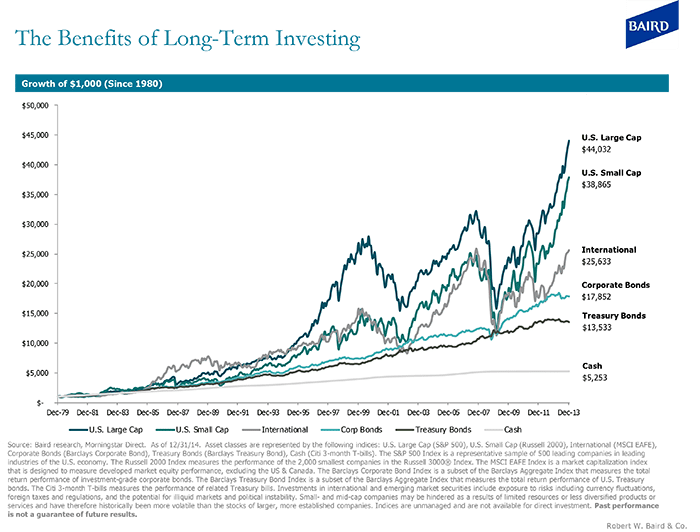 However, if you have a well-diversified portfolio comprised of stocks, bonds, mutual funds, and exchange traded funds which are diversified both in size, geography, and industry, you have significantly reduced your risk and can still seek long-term growth. The good news here? Women are shown to be great investors over time because we can stick things out for the long-term (patience is a virtue, you guys, just check out the graph provided above) and are not as emotionally attached to our investments (making us more likely to ditch the losers – boys and stocks alike). It’s important to note that it’s often better to not try to beat the market. Be smart. Diversify. Don’t be too quick to change up your investments. Colleen adds, “There have always been good reasons not to invest, but the market has ultimately moved upward.” In other words, yes there is risk involved – but generally speaking, things will work out in the end. Investments are best-suited for reaching long-term goals (ahem, retirement) most of us can’t reach just by savings alone. We’ll dig deeper into investments next time (like, what the hell is an ETF? ), but if you have any questions or anything to add on this topic, please let us know in the comments!